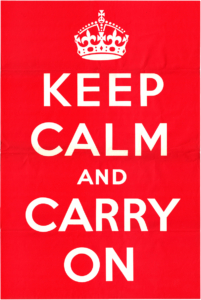 “Keep Calm and Carry On” reads an iconic motivational poster produced by the British government in 1939. The intention was to steady the nerves of an anxious public being thrust into war with Germany. Now, despite my mistrust of Instagram as a valid form of communication, I wasn’t around for World War II. But I am fascinated by the propaganda coming out of the U.S. and Europe at the time. Since that discovery, something odd and disturbing has happened. Countless T-shirt manufacturers, meme creators and other miscreants have co-opted the “Keep Calm” phrase to make a quick buck or perhaps entertain their lame-witted friends. Keep Calm and Go Wild: That makes absolutely no sense. Keep Calm and Chive On: That makes even less sense. Keep Calm and Eat Cupcakes: A recipe for rampant obesity? Keep Calm and Love NYC: I’m all for loving NYC, but it’s impossible to keep calm there. Keep Calm and Curry On: Okay, that one’s pretty good. I could go on, but you get the idea. Please join me in rejecting this cynical co-opting of a quintessentially British slogan and refusing to buy any “Keep Calm” knockoffs. Unless, of course, you want to pick up a “Keep Calm and Curry On” coffee mug. I could live with that.